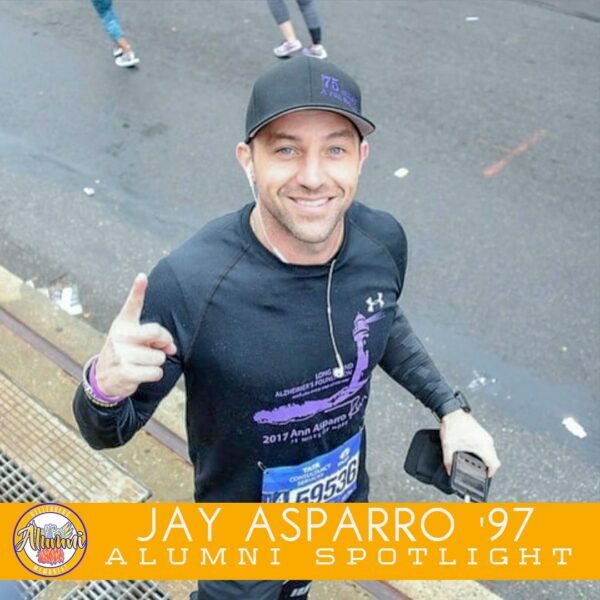 Following graduation from Kellenberg, Jay attended Hofstra University and received a Bachelor of Business Administration degree in Management in 2002. Over the last 15 years, he has worked for Merck, Smith & Nephew, AposTherapy, and is currently an Account Manager at Bausch Health. Jay sold medications and devices to clinicians in primary care, psychiatry, wound care, orthopedics, and dentistry. He currently sells medications and devices in the dental market. Jay resides in Plainview, with his wife, Allison, daughter Olivia (6), and son Shane (3). Kellenberg allowed me the opportunity to be surrounded by an extraordinary faculty, student body, and culture. KMHS has instilled a high moral intelligence that has given me a foundation to be a better person by helping others in our community. As a student, I didn’t understand how important faith would be in my life. Looking back now, I have to thank Kellenberg for helping me build the faith that I have today. How did you get involved with endurance running as a way to raise awareness and funds for charity? After graduating from Hofstra, I ran a handful of half marathons from 2009-2015 to lose weight and stay in shape. After every half marathon I completed, I’d always think to myself: you have to be CRAZY to run 13.1 more miles to finish a marathon. It was always a far-fetched dream for me to run the NYC Marathon, but I thought it would be an amazing feeling to run through the city that I lived in for 6 years and visited my whole life, as I am from Long Island. In March of 2015, I registered for the NYC Marathon with mixed emotions — some excitement, some nerves. When I crossed the finish line of the marathon, it changed my life forever. After completing the marathon, I began to use running as a platform to raise awareness and money for the Long Island Alzheimer’s Foundation, in honor of my Grandmother, Ann Asparro, who is living with Alzheimer’s. I also wanted to run for my parents, my aunt and my uncle, who are my grandmother’s primary caregivers. However, I did not believe a half marathon or a marathon would suffice for raising awareness around Alzheimer’s. That’s when I decided I would run 90 miles over three days from Montauk to Plainview on Long Island. The 90 miles represented my grandmother’s age at the time. This is when The Ann Asparro Run was created. On Friday, November 4th, 2016, I ran 29.4 miles. On Saturday, November 5th, I ran 31.2 miles. Finally, on Sunday, November 16, I ran 29.4 miles, completing the 90-mile run. Can you share a little more about the first Ann Asparro Run and what you learned from it? The 2016 Ann Asparro Run raised $37,000 and for every mile I ran, I dedicated a mile to a family who has lived or was living through the effects of Alzheimer’s. That year, I learned about self-belief, perseverance, focusing on solutions (not the problem), and that anything is possible. The 2016 Ann Asparro Run would have never happened if it wasn’t for the love my grandmother had shown me and the rest of my family. I’m so grateful to my running coach, Alex Arslan, who gave me the encouragement and correct training plan to complete this incredible feat. In 2017, I continued to raise money and awareness for the Long Island Alzheimer’s Foundation, in honor of my grandmother. My grandparents would have celebrated their 75th wedding anniversary in 2017, so I decided to run 75 miles in two days. I ran 48.8 miles on Saturday, November 4th from the north shore of Long Island to the south shore. Then on Sunday, November 5th, I ran the NYC Marathon. Due to knee pain, this was one of the most challenging and difficult days I’ve ever had to endure, but I knew I was running for my grandmother and for Alzheimer’s awareness. I sacrificed so much during my training and worked so hard that there was no way I was not going to finish. Not only did I finish 75 miles in two days, but together, we raised $18,000 for the Long Island Alzheimer’s Foundation. Again, I could only reach this achievement with the love for my grandmother and my family, as well as, supporting other families living with Alzheimer’s. In 2018, I challenged myself to complete the Lake Placid Ironman (2.4-mile swim, 112-mile bike, 26.2-mile run). Unfortunately, during the swim, I was injured by a competitor and had to be taken out of the water. My race was over, but I knew there was something I could do which I always fall back on… running. So I grabbed my running gear, and I ran 26.2 miles on my own, away from the Ironman race. This was a disappointing day, but I was still able to complete a marathon. Just recently on September 9th, I traveled back to Lake Placid, and I was able to swim around that lake for 1.2 miles and completed the Lake Placid Ironman 70.3. So far this year, we have raised $11,000 for the Long Island Alzheimers Foundation. Who was your favorite teacher/coach/moderator when you were a student here? I played soccer at KMHS and Mr. Declan McSheffrey was my coach, as well as my history teacher, and someone with whom I had a great relationship. Father Tom was/is someone I love speaking with and I always feel better after speaking with him. With this month of November being National Alzheimer’s Disease Awareness Month, can you share with the Firebird Alumni family what your next endurance running fundraising initiative will entail? I’m currently organizing a run from my grandmother’s family’s city of San’t Angelo a Fasanella to my grandfather’s family’s city of Bari in Southern Italy for late 2019 or early 2020. This run across Italy will consist of one marathon a day for six days. I continue to try to create a platform through running that has a meaning to me so I can raise money and awareness for the Long Island Alzheimers Foundation to honor my grandmother, Ann Asparro.